Getting yourself fit to ride needn’t be a laborious trek to the gym three or four times a week. There’s a simple piece of exercise equipment you can use at home, in the office or while sitting at your computer. It’s affordable and can be used as part of your daily life. It’s the exercise ball. A cardiovascular workout builds stamina and boosts your energy levels. This is important for busy riders who try hard to fit riding into an already demanding schedule. Cardiovascular conditioning will help you to increase your heart and lung capacity, retain your muscle strength, increase your bone density and reduce your body fat. You don’t need special equipment, although treadmills and exercise bikes add variety and make it easier. Learn to enjoy walking, either on the treadmill or through the local park. Dancing is excellent, as is jogging. Or simply take up squash it provides the best cardiovascular workout a body can have. Basic cardiovascular conditioning requires 30 minutes, three times a week. If you can’t set aside a full 30 minute block, then three 10 minute periods will do just as well. Your goal is to do an activity with enough intensity that you raise your heart rate. You should be able to carry on a conversation after the exercise and if you are gasping for air or breathing too hard you are doing too much too soon. Simple exercise to improve your strength is important as riders have to maintain challenging positions during riding. eg; classical dressage riders need strong shoulder, back and abdominal muscles to maintain their shoulder, hip and heel positions on a moving horse during upward and downward transitions. All areas of the body work together while you ride and no single muscle or muscle group, does all the work. So muscle balance is very important. If you are strengthening your chest you also need to work on strengthening your back to balance your muscle groups. Improving flexibility helps you maintain a correct posture and improves your range of motion. It allows for more subtle use of your aids by enhancing control over each part of your body, making it easier for you to apply the aids independently; and this become more important as we age. So, get on the exercise ball for a really simple; simple exercise. A gym membership or weight-training equipment can help but they’re not really necessary. The exercise ball will help you improve your balance, flexibility and strength and tone your abdominal muscles. Make sure you read the following beginners guide and have a ball that is right for your size and make sure you warm up first. The Basics of Sitting on an exercise ball. The act of just sitting on an exercise ball is active and requires your core body muscles to work to hold your body upright and balanced on the ball. Until sitting on the exercise ball feels comfortable, it is often a good idea to not fully inflate the ball – a slightly deflated exercise ball is more stable. Sit in the center of the ball with both feet firmly on the ground about shoulder width apart. If this is difficult, then use a wider stance. Your knees should be in line over your ankles. Your shoulders should be in line over your body (not hunched forward) and your head squarely over your neck (not leaning forward). 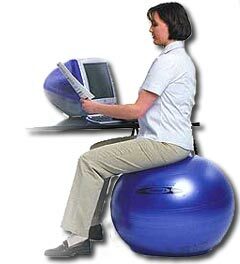 You can easily sit on the exercise ball while working at your desk or computer workstation and use it as an alternative to a traditional office chair. Some people prefer to sit on it while watching television. Whatever you prefer, just sitting on an exercise ball at some point during the day helps to strengthen the core muscles that support your spine. And, that’s what improves your riding. This reduces strain on the heart and helps crestor online canada it maintain..